2 days before 2016 ends, Indian Govt. has given a solid parting shot for its cashless, digitalized economy. Bharat Interface for Money or BHIM app has been launched by the Govt. which simplifies the process of cashless transactions, and has the potential to give established ewallets such as Paytm, Freecharge, Mobikwik etc a run for its money, literally. The Aadhaar card based app, which combines the power of UPI (United Payment Interface) and USSD (Unstructured Supplementary Service Data) into one, was launched by PM Modi during Digi Dhan Mela event in Talkatora stadium in New Delhi. As we used the app, we found the interface super clean, and the usability flawless. Within 10 seconds after downloading the app, the user can transfer money, receive money as well as check his linked bank account’s balance. The app makes a default UPI based payment address: <phone-number>@UPI and allows one customized address; either of which can be made primary address to receiving payments. The app also allows bar code based transactions, and even transfer to non-UPI banks by using ISFC and MMID based codes. 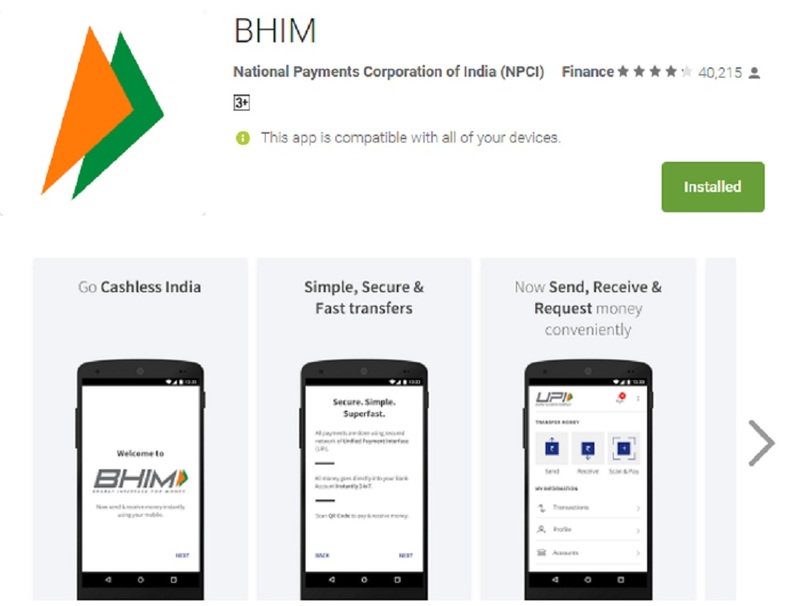 Currently, the following banks are being supported by BHIM app, because they have started UPI based transactions: Allahabad Bank, Andhra Bank, Axis Bank, Bank of Baroda, Bank of India, Bank of Maharashtra, Canara Bank, Catholic Syrian Bank, Central Bank of India, DCB Bank, Dena Bank, Federal Bank, HDFC Bank, ICICI Bank, IDBI Bank, IDFC Bank, Indian Bank, Indian Overseas Bank, IndusInd Bank, Karnataka Bank, Karur Vysya Bank, Kotak Mahindra Bank, Oriental Bank of Commerce, Punjab National Bank, RBL Bank, South Indian Bank, Standard Chartered Bank, State Bank of India, Syndicate Bank, Union Bank of India, United Bank of India and Vijaya Bank. Right now, only one bank can be linked with the app, and all transactions will happen from that bank account only. iOS users need to wait a little longer, as the app is only available for Android users as of now. BHIM leverages the power of UPI and USSD into one, which enables the user to optimally utilize single platform for all his cashless needs. Thus, if a user has bank accounts in three UPI enabled banks, then BHIM will converge all his banking activities, and enable him to conduct cashless transactions without hassles. The single @UPI payment address will protect his identity and personal details. The interoperability aspect makes it a big deal, compared to other e-wallets, which basically replaces your physical wallet with a digital one. But BHIM directly connects the bank accounts with a safe platform, thereby saving you time and hassles of maintaining multiple wallets. One of the master-strokes of BHIM is that, it can be used without Internet. *99# program for conducting cashless transactions is being supported by BHIM, which makes it a deal-clencher. Only Paytm provides Internet-less cashless transactions, but that feature is not that robust, considering that you need Internet to link the bank accounts, and to infuse funds. But with BHIM, a non-smartphone user can transact from the word go. Once the merchant connects a bio-metric device with his smartphone (after installing BHIM app), then he can easily accept payments from buyers by using their finger-print. The Aadhaar protocol kicks in here, as the fingerprint is directly matched from the main server, and the payment is done. This facility is right now not available on any e-wallet, which makes BHIM a superior technological product, compared to any other e-wallet. Rural citizens who are don’t even know how to read and write can easily, seamlessly pay via BHIM, using their bank account. In a way, BHIM effortlessly connects the Aadhaar card, mobile phone and UPI/USSD technologies to provide a digital platform for making and receiving payments. Till now, BHIM can be described as the Govt. biggest, most ambiguous project for promoting cashless payments. In the coming days, it would be really interesting to observe how BHIM makes a dent in the market of Paytm, and other e-wallets. We will keep you updated. "3 Reasons BHIM App Can Give Paytm, Freecharge, Mobikwik A Run For Their Money", 4 out of 5 based on 7 ratings. Top 5 Most Controversial Advertisements Of 2016 – Ideas Which Faced Backlash! A great initiative has been taken up by the Govt. of India. We the employees of SysTools Software (https://www.systoolsgroup.com/) use & adore this application. A good effort made by the GOI in making India go cashless. How will bhim work on non smartphones? Which feature phones are supported and where to download the java apps for them? I guess symbian or maybe j2me based apps might be available for use with ussd?? BHIM app is NOT needed for feature phone, *99# USSD service has been upgraded to support UPI based transactions. Would the receiver of money has to suffer with any bank charges? Would the Govt. will supply free the Thumb image scanner? Would 0.75% discount on E-transaction will be applied on purchasing through BHIM? Any other expenses has to be bear by payer/receiver? Ambiguous? LMAO!!! Saar, please hire a competent proofreader. Ambiguous kahan, ambitious kahan.